Let’s say your parents told you growing up that you were good enough at basketball to join the NBA. Would you believe them? If they fed you that line every day for the first 17 years of your life, you would probably come to believe it…at least until the first day of NBA tryouts. A harsh reality would sink in, and you’d probably not be too happy with your momma and daddy! But do you realize we do this exact thing all the time in education? We convince many children that they are something they are not. We create a narrative that tells them they know things they don’t. We lower the bar and then tell kids they are really good pole-vaulters. In many ways, we lie to them about what they are capable of, and we do this through a process called “grade inflation”. We must first admit that our grading system is probably broken. We make a feeble attempt to place a number on a very abstract concept (learning)—one that is really hard to pin down. We try to quantify learning using tests and quizzes we’ve written (or that were provided with our curriculum), knowing full well we spent far less time planning those questions than we did the funny YouTube videos we showed while teaching the content. Yet we stand by these quizzes, tests, and resultant grades, daring anyone to suggest that our scores, our numbers, our quantities may in fact not be terrific. How dare you! It’s one thing to be dogmatic about a grading system, but it’s another to not realize what our traditional grading does to the minds and self-concepts of students. The basic idea of grade inflation is that we intentionally (or more commonly) unintentionally award higher grades than students deserve. Now, most educators would never purposefully “give away” grades or reward a student with a high grade for doing little work. That would be intentional grade inflation. Intentional grade inflation comes up more frequently in higher education as universities vie for rankings, which are often based on student grades. The higher the grades, the better the school, right? Or so goes the logic. Giving completion grades on assignments. In this case, teachers are using the grading system, meant to quantify learning, as a reward system for acceptable behavior and a good work ethic. Learning and behavior should be kept separate so the measurement of learning can be as pure as possible. Including bonus questions and assignments. This procedure dilutes and waters down the grading system and lowers the academic bar. Teachers actually insult themselves by giving bonus work because they create a standard (the test) and then give students a step ladder to reach it. Why do teachers give bonus work? Because higher grades, inflated or not, make the teacher look better. Right? Grading subjective assignments (such as essays, projects, etc…) with a less-than-critical eye. Let’s face it: “Authentic assessments” (those that test a student’s ability to apply information rather than memorize it) do not pinpoint learning in the way that objective tests do. Therefore, the tendency is to grade these assessments higher than normal. I’m all for authentic, practical assignments, but teachers need to be aware of what these do to grades and grade them more authentically. “Curving” grades to raise the average grade. Why do we “curve” grades? Does curving suddenly change what the students learned? Of course not. A great question to ask here is, “Who benefits from curving grades?” The answer is obvious: The teacher! Higher grades, means better teaching, right? Assuming that someone should be getting an A. This is particularly a problem in smaller schools where there may be less competition and smaller class sizes. As the number of students decreases, it becomes more and more difficult to determine who is “normal” (by normal, I simply mean average). Teachers assume that someone in the class must be an A student (afterall, doesn’t every class have to have at least one? ), whereas that student in a larger setting might be a B or a C student. So, while a student from ABC Small School gets an A, her coequal in XYZ Large School is sweating just trying to keep a B. The student, his/her parents, and the next school he/she attends are more likely to make false conclusions about what that student actually knows. This is dangerous, for example, when a student enrolls in a college degree program under the assumption that she is highly knowledgeable in that content area, only to find out she is not. For example, let’s say a student gets very good grades in high school science through hard work, completing assignments on time, and having a likable personality (all grade inflators, by the way). She decides that nursing is the career for her and so, based on her high (yet inflated) grades in science, she applies and is accepted into a nursing program. She then promptly fails her freshmen-level science courses. Who is to blame? I say it’s the one who gave her an inflated, unrealistic view of her capabilities in high school. There may be false conclusions about what the teacher has actually taught. Think of this issue in extremes: Let’s say a teacher only covered 10% of each chapter in a textbook, and the students all received high grades. Is anyone likely to ask any questions? Probably not. Afterall, the students got high grades, so what’s there to talk about? Obviously, a closer look (hopefully by an alert principal) would reveal the watered-down condition of the course and the subsequent inflation of grades. But is anyone looking? Ultimately, there is also a possibility that the reputation of the school and the teacher may be tarnished. If a teacher inflates grades knowingly, he/she deserves the tarnishing. However, as I mentioned before, grade inflation is more commonly unintentional and accidental. It’s worth taking a closer look though, especially given that a student may get to college, only to realize his high school teacher gave him a false impression of what he was capable of. Ok, so grade inflation is an issue, but how do we know if we’re actually guilty of it? Rather than just talking about it, what proof is there that grade inflation is actually taking place? To evaluate our school program with some level of objectivity, we’d need an outside resource that has credibility. In other words, we don’t want to just compare ourselves to ourselves. Enter standardized tests! You know, those yearly bubble forms we slog through so we can brag about “evaluating our curriculum program”? Other than photocopying the results, mailing a copy to the parents, and filing away the paperwork, I wonder how many schools actually use the results to make curriculum decisions? Does your school? I’ll mention too that standardized tests–such as Stanford and Iowa–are one of the most valuable sources of information we have available. These tests are not just pulled together from a curriculum test bank. These tests are written by experts, researched for years, and given to thousands of students. They have high validity (they actually measure what they say they are measuring) and reliability (they produce consistent results among test-takers). In other words, the tests we give on a routine basis at our schools can’t hold a match to standardized tests. We’d be crazy not to use their data to improve learning (By the way, that’s called “research-based decision making” to use modern educational buzz-words). It is important however to remember that standardized tests are based on percentile-rankings and need to be interpreted correctly (see your test’s explanations). For upperclassmen, compare students’ ACT scores to their English, Math, and Science grades (These are the three main areas on the ACT). While average ACT subject-scores can change slightly from year-to-year, the means generally hover in the low 20’s. So, for example, if you have a student with Math grades in the high 90’s all throughout high school but scores a 15 on the Math portion of the ACT, there’s a chance he was given an inflated view of his Science knowledge by the school. Generally speaking, a student with high grades should be scoring highly on the ACT. If not, it’s worth considering that his/her school grades are inflated. For all grade levels, compare students’ achievement test scores (I refer to Iowa, but this could also apply to other tests such as Stanford) to their grades in all classes. Again, it’s pretty intuitive that a student who is receiving high grades in school should also be scoring well on these tests. If not, it’s possible that the grades the school is supplying do not jive with what the student is capable of in the open market. Grade inflation could be present (I’ll run this exact comparison next). Let’s say we wanted to correlate shoe size with body weight. Those two variables will certainly correlate to some degree. However, we also know by common sense that a bigger shoe size does not always mean higher body weight, and vice versa. So, while these two variables are related (correlated) they are not likely to be having a strong effect on each other. In other words shoe size does not really explain much of the change we’d find in body weight. The correlation may be present and not random, but the effect may be so low that we could reasonably say the two are not leaning on each other. In the case of school grades and achievement test grades, we would expect the two measures to be leaning on each other. After all, science grades in school should be based on similar content as science scores on achievement tests. There is a reasonable expectation that changes in school grades should also change achievement test grades. So here’s the data you need to collect to run a few simple correlations on your entire school. I suggest running these tests across the entire student body so the results give a better indication of the school as a whole, not just of the high school. Achievement test scores for Science, Math, English Language Arts, and Social Studies. While these are percentile rankings, this is fine because all we’re attempting to do is correlate high scores with high scores and low with low. Each student’s final grade for Science, Math, English Language Arts, and History from the same school year in which they took the above achievement test. You may need to do some work to get the grade averages, but an Excel or Sheets spreadsheet can do this for you quickly. The significance level (if the p value is less than 0.05 then the results are not due to chance, which is normally a good thing. If the result is non-significant, this means the relationship between the variables is only due to chance. 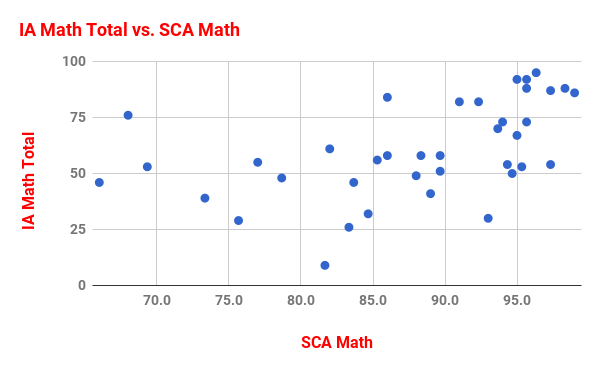 In the context of comparing grades, a nonsignificant finding would mean the two sets of scores are not even related which would be really bad news). The coefficient of determination, normally called the “R squared” value. This is the effect size and tells us how much of the change in one variable is attributed to the other variable. This can be interpreted in a few ways, but the basic gist is that the lower the effect, the less consistency there is within the data. 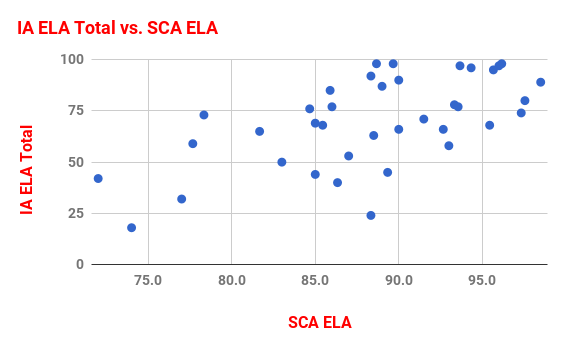 When it comes to grades, if the effect size in our correlations is low, it will be safe to conclude that school grades are not increasing achievement test grades, which would go against what we’d expect. After all, the content kids are learning in school should be influencing how they’re doing on the achievement test. Unless of course the grade they received in school was an inflated measure and gave us a poor indication of what he/she actually knew. The final question is what effect size is considered “low”. At what point do we look at the effect size and begin to raise our eyebrows? The easiest answer to this question is simply to say that anything above the 30-40% range is pretty good, especially in a correlation when there are many uncontrolled variables in play. The further we drop below 30%, the more cause there is for concern. English grades and Iowa English scores were significantly related (R = .61, p < .05). The effect size was moderate (R2 = .37) showing English grades at school are causing higher English scores on the Iowa, as they should. History grades and Iowa Social Studies scores were significantly related (R = .54, p < .05). 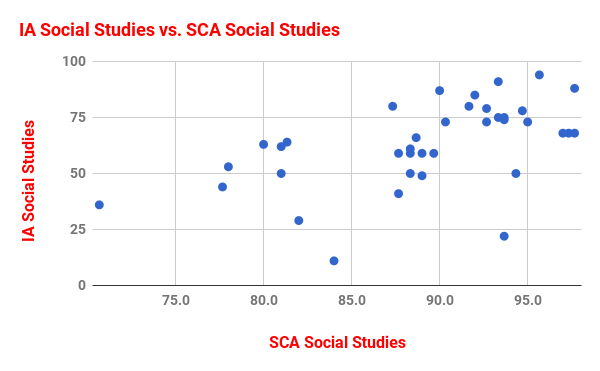 The effect size was good (R2 = .29) showing Social Studies grades at school are somewhat causing higher History scores on the Iowa. Math grades and Iowa Math scores were significantly related (R = .48, p < .05). The effect size was fair (R2 = .23) showing Math grades at school are only somewhat causing higher Math scores on the Iowa. This result is concerning. 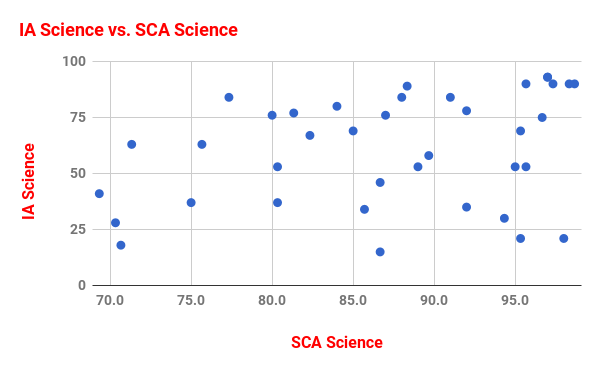 Science grades and Iowa Science scores were significantly related (R = .32, p < .05). However, the effect size was poor (R2 = .10) showing Science grades at school are only slightly causing higher Science scores on the Iowa. This result is alarming. Of these four comparisons, the one causing most concern is Science. The effect size of .10 can also be interpreted as “only 10% of Iowa Science scores are explained by Science grades”. While the two measures do rise together, the low effect size indicates it is very hard to conclude that an increase in school grade is causing an increase in Iowa score. Another conclusion (which I lean toward) could be that Science grades from school are actually giving an inflated impression of what the students know. They are receiving school grades that tell them they know a lot, but when they take the Iowa, it turns out they don’t. We should avoid “completion” grades that reward good behavior (non-learning) with a high grade (intended to measure learning). If a completion grade is given, its value should be relatively minuscule. We should be more aggressive in grading “soft” assignments that lend themselves toward subjective grading. Assignments such as essays and projects tend to be graded more liberally than objective tests, driving up grades artificially. We should weight comprehension skills and questions more heavily than those involving rote memory. Because comprehension involves higher-order thinking, we want to give that skill more value in the grade book. We can do this by making comprehension questions and assignments worth more points. We should be more aware of our students’ standardized achievement scores so that we are guarded against giving grades that are outside our students’ normal ability level. We should avoid the “someone needs an A” mentality, especially in small-class settings. While students may certainly be capable of high grades, we should not necessarily give them away. So, we have a choice to make: We can either ignore grade inflation, which we can be certain is taking place, or we can choose to improve our teaching and do something about grade inflation. Correcting this issue simply takes an understanding of knowing it exists and realizing it’s easy to inflate grades without really doing it on purpose. Once you’re aware of it, grade inflation is fairly simple to avoid. There’s a little more work involved to actually track it down within your school, but it can be done.